A vanguardist tango musician from the 60s. Son of Italians, born in Buenos Aires. Alberto Pascual Caracciolo (1918-1994) was a brilliant tango musician. He was a musical arranger, orchestra director, composer and bandoneon player. He was respected and well known by his colleagues rather than by the public in general for Caracciolo always chose to hold a low profile and he acted on different important radios and occasionally on TV but he did not point to having a massive diffusion of his music. In 2003 his friends and relatives started recording and distributing Caraccioloâ€™s albums to make his music known, for he has been mentioned in different newspapers, magazines, radio and TV, but little music of his is sounding on radios or other places where tango is heard or danced. Since then, things have changed enormously, due to the issue of two CDs, one of them released by UMI (UniÃ³n de MÃºsicos Independientes) and distributed by Pattaya in the most important music shops all over Argentina. 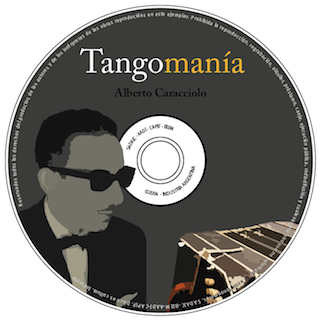 His daughterâ€™s email appeared in the CD â€œSolos de BandoneÃ³n y mÃ¡sâ€¦â€� and many people wrote to her remembering Alberto Caracciolo for his presentations in radios such as Del Pueblo Radio, Splendid, El Mundo, Belgrano which transmitted a concert from the Faculty of Medicine with the best tango avant-garde artists (in the early sixties). He was born in Palermo, Buenos Aires, on the 23rd of March 1918. He began his musical studies at the age of 8, and at 16 he started playing bandoneon in Antonio Arcieri's orchestra. He played bandoneon for different famous orchestras, such as the ones of JoaquÃ­n Do Reyes, Ã�ngel D'Agostino, Manuel BuzÃ³n, Victor BraÃ±a, Jorge Caldara. He made musical arrangements for Caldara and he was his first bandoneon, he was one of Anibal Troiloâ€™s musical arrangers, and worked as musical arranger and director under Carlos GarcÃ­aâ€™s orders in OdeÃ³n, between the years 1969 - 1970. Although he was a tango renewer following a style of his own, he played traditional tango in the â€œDe Ayer... y de Siempreâ€� L.P., produced by Discomundo, for which he created Quinteto AÃ±oranzas, including flute, which was an instrument greatly valued in the old traditional groups (according to Roberto Selles, tango journalist and historian). He also played jazz although in a minor scale, he made musical arrangements for international publishers, and he was a music counsellor for OdeÃ³n (Argentina), in the late 60's and early 70's. As we have already said in our first lines. One of the best anecdotes about Caracciolo is related to his job as musical arranger, writing one arrangement for the famous tango musician, Anibal Troilo, who was known for always having a rubber in his pocket to rub out parts of the arrangements when he was not satisfied with them. But Caracciolo's arrangement for the tango â€œTierritaâ€� remained untouched by him. Caracciolo is the author of â€œTema de Tango en Re Menorâ€�, â€œPreludioâ€�, â€œEtÃ©reoâ€�, â€œChiquiâ€� (dedicated to his wife), â€œCon Rumbo al Cieloâ€� (dedicated to his father), â€œRÃ©quiem para un GomÃ­aâ€�, (dedicated to Gardel), and many others which have lyrics by famous tango poets. Nowadays, his music sounds from Salta to Ushuaia in Argentina, and in Russia, Greece, in this case thanks to Camilo Gatica's work, who finished his studies in art in Santa Rosa, La Pampa, and young musicians have asked for his music scores to teach Alberto Caraccioloâ€™s style in music schools, they are MartÃ­n Siccardi from Mar del Plata and Javier Bravo from Buenos Aires City. We have received many surprises on doing this diffusion work, which we will illustrate and describe in due time. para calmar los agravios de las mentiras de amor. el misterio de la vida que intentamos descifrar. y en el alma sÃ³lo existe nada mÃ¡s que decepciÃ³n. nuestro mundo de esperanzas se ha deshecho en el rodar. si se asoma otra esperanza... Â¡la dejamos al pasar! I thank you for learning more about Alberto Caracciolo and listening to his music. This means a lot to me and my family. I sincerely hope you enjoy it!